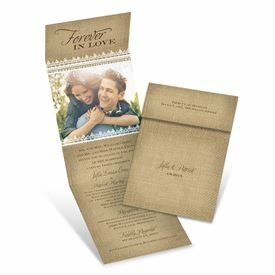 A burlap background with lace finish around your photo becomes a charming and romantic introduction to your wedding day. "Forever in Love" appears in the font shown in your choice of color above your photo. Your names and wedding date appear on the outside front of these folding invitations. Your wording is printed in your choice of colors and fonts. This Invitation with Online Reply is cleverly designed to include everything you need in one self-mailing piece without the fuss of additional cards. Open it to reveal your invitation wording and room for other important details below, such as reception and/or accommodations information. The RSVP date appears with your wedding website (or email and phone number) at the bottom. Seals are included for securing these invitations closed when mailing. Your return address is printed on the outer flaps for no additional cost. Envelopes aren't needed. We absolutely loved this invitation. Great price and great quality. At first I loved these invites when I got them. They are so cute and I love that they have a picture as we skipped save the dates. When we actually started to assemble the invites I realized that I hadn't thought things through logistically. I took an invite to the post office, and they advised to use at least 4 stickers to secure the invite instead of the recommended 3. If we had used only 3 (one to secure the flap, 2 to secure the sides) the invites would have gotten caught and mangled in the mail sorting equipment. I purchased additional mailing stickers through Amazon as they were more cost effective. Also, be advised that they will arrive to your guests in "rough" shape. There will be all kinds of stamps on the outside of the invite - as there normally are on the outside of an envelope. If you're concerned with the presentation of your invites, this is probably not the right invite for you. Also, as your guests open the invites the stickers will probably rip the outside of the invite. I've seen our invites hanging on various guest's refrigerators, and some were very careful opening the invite while others were not. All in all, I'm satisfied with these invites for the price, but if you are especially concerned with presentation and perfection these are probably not the right invite for you.